The Committee that was reviewing net neutrality this past year failed to pass the legislation onto the legislative houses in a tie vote. This was great news for people who believe that the Internet should remain a level playing field. While the fun was going on, I was encouraging everybody I could to call, email, fax their Representatives and let them know that they support a flat Internet. With both the house and the senate in Democratic hands, it seems likely that this issue should go away. The Democrats now control key committees and Ed Markey (D-Mass.) it seems will be the the committee chair person for the Telecommunications and the Internet Subcommittee while John Dingell of Michigan will take the place of Ted Stevens on the Energy and Commerce Committee. Save the Internet has a great post dealing with the change in power on the hill. How does this issue affect the arts? Well, most arts organizations have some level of Web presence. In the case of WESTAF, where I work, much activity is engaged on the Web. If the new laws were passed ceasing Net Neutrality, we could have been pressed by the telecoms to pay extra money to pass our packets to our end users in a timely fashion. In other words, it could have brought CultureGrants Online(tm), ZAPP(tm), CaFE(tm), ArtistsRegister, and Artjob to a halt. Sometime back I posted my thoughts on pushing an arts agenda in our current political environment. Things have changed somewhat in the last few days. In some ways for the better, and some ways for the worse. First off many of the Republicans who have been ousted were moderates. Lincoln Chafee from Rhode Island is more liberal than many Democrats and I have mixed feelings seeing him go. He is pro-choice and pro gay rights. In fact, Chafee has indicated that he may not stay with the Grand Old Party. This means, in many cases, that the Republican side of the equation is even more conservative than ever. However, many highly moderate Dems have been elected--ones that show quite conservative bents. I think, in balance, we will probably see a shift towards the centre but there will be an extremely determined GOP force starting the effort to keep the White House and gain control of the two chambers. This probably means that very little will get done in the next two years. While Bush has pledged to work in a bi-partisan way, his actions today to push unpopular agendas forward with the lame duck houses prior to the Dems taking control in January belie his true colours. I predict a modest increase in funding to the NEA and NEH. Nothing so great as to cause ripples. I also predict that we will see modest tax increases as an attempt is made to balance a horribly out of balance budget. The Arts community has to find ways to increase its perceived numbers. The only way to effectively do this is gain relevance with young citizens. So, again I stress how important it is for the industry to get with the program and make use of Web 2.0 tools that make sense to this segment of participants. They DO participate, just not in traditional "going to the opera, theatre, museum" activities. The industry won't convert them to being traditional participants so the industry will have to adapt to include Web based videography, photography, and literature. Actually, the concept of literature is interesting in itself. Everythingcasting has made a huge number of writers accessable. In the past, the closest folks might get would be publishing via a vanity press with no hope for distribution. Everythingcasting has changed this. With a bit of smarts almost anyone can have a dedicated and not insignificant group of readers. Web 2.0 has also had a significant effect on affecting voter turn out utilizing systems such as MoveOn, Facebook, My Space, and so forth. Keep your socks on, we're only scratching the surface so far. I am personally very excited and feeling optimistic about what will continue to come in our direction. I was looking for a good "cloud" widget or script for my blog. For those of you who don't know what a cloud is, when you see linked tags on a page where the font sizes range from really small to really big it is called a cloud. It gives you a sense of which keywords are the most used, most clicked, and so forth. It is a pretty cool visual clue/cue for your users. 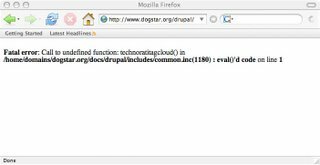 I found, what I thought would be, a really good wee script for technocrati users and rather than READ carefully, gleefully installed it into the "block" feature in Drupal. I intiated it and BLAMMO! So I went back and read. Not only did I use the wrong script for Drupal, I also neglected to include an api key. So, no access to the back end to fix the problem. A buddy at Brownrice, my Web host, is going to go the backup and recover the last backup for me. It is a reminder that you really ought to read before loading things into software higgledy piggledy. It also has me thinking I might start doing a backup myself locally so I can experiment, screw up, and not have to find a friend to fix things for me. Oh well, THANKS OBAN. I'm looking forward to having my site back. The last couple of days I’ve been in La Quinta California just outside of Palm Springs. I stayed at the La Quinta Resort and Club. This isn’t a La Quinta chain hotel. It is a high end resort community mixed between time shares, rentable rooms, and homes. Apparently the resort has 41 pools and 30-some hot tubs. In the immediate area there are over 100 golf courses. The resort has several restaurants. Last night I had the biggest most delicious crabcake I think I’ve ever had. The room was large with a fireplace, wet bar, dual sink vanity, a tub, a separate shower, and a crib area for parents with small children. Outside were orange trees. The rooms/cassitas are lovely. Why have I been in La Quinta? For a ZAPP™ jury for the La Quinta Arts Festival. Talking with a variety of jurors and artists in attendance it became clear that the acceptance of ZAPP™ is growing pretty steadily. The updates that have been made to improve the system have significatly improved the efficiency of the jury/panel process. I’m pleased that some of our software updates have proven effective. La Quinta’s jury took place in a one year old Elementary School called “Benjamin Franklin”, the same place as last year. The school is fortunate enough to have a state of the art computer lab in the library. Oh, and it was HOT. 93 degrees F, in November. RSS feeds have significantly increased the readership on blogs but it hides the true readership. It also strips out rich media that some work hard to embed in the text. Embedded images from flickr, revver, and YouTube are all unavailable unless the user goes to the source. You can “reclaim” some of the traffic statistics using a system such as feedburner to create your RSS feed. Feedburner gives you stats of RSS aggregators that are accessing your feed. Feeds can be accessed via feed readers, web aggregators, and email. The great things about aggregators is that you can scan multiple blogs and news sites in a single place and format. This can save time but reduces the richness of well structured sites. The impact for art sites is significant. RSS feeds can strip embedded content so art can be removed from the site changing the context of the posted text. While RSS feeds do increase the reach, they can seriously impact. Does this mean I think artists, art organization, and arts policy bloggers should avoid providing feeds? Nope. If your text is compelling enough it can draw readers to your site. INCREASE YOUR REACH! Offer feeds. One of the cardinal rules of developing community on line is to post new content every day. I try, and don’t always succeed, to post at least one message on my blog(s) as possible. 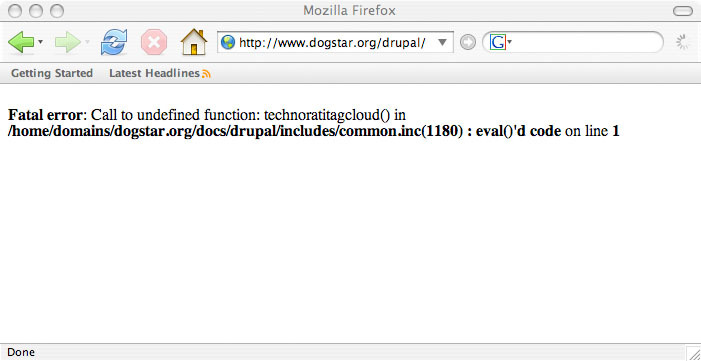 This is doubly important as I transition from imagespace.blogspot.com to dogstar.org/drupal. So, when you are trying to create community on a blog, here are some tips/thoughts. 1) Post every day you possibly can. 3) Include rich media like video, audio, and pictures. 5) Promote your materials—one can do this for free or near free by posting to other forums that have a similar bent, posting to other forums in which you already have a voice, and getting as many links back to your site as possible. 6) If you can, ensure that folks can easily add you to DIGG, Technorati, Google, Yahoo, and other search engines and social networking sites. 7) Offer your materials under a creative commons license to encourage sharing. Sharing is good. 8) Syndicate content from others who are sharing using the creative commons license. 9) If a conversation begins on your site, encourage it EVEN if you disagree with the poster. Discourse is essential to building a vibrant interesting community. VOTE! It is election day. Excercise your one of your rights and go to the polls. This is an important mid-term election that could have either a chilling or positive effect on what direction the United States heads in the next couple of years. A friend asked me about what I thought of widgets recently. Beth Kanter has been a non-profit technology consultant for some time and is championing Web 2.0 in this arena. She has asked what people in the industry think about widgets and the level of acceptance/utility they will have in building community. The Ferret Moderated List—a listserv that has existed for ever. The AVSForum—A forum of audio/videophiles. The MacAddict Forums—a place for Mac-obsessed technophiles. Any time you have folks that are passionite about something, you will see community build around that thing/topic. Asking whether widgets will foster community is a tricky question. The predisposition for community will exist whether widgets are used or now. What a widget will do is make it easier for that community to embed interesting rich content into sites. This in turn attracts others to come participate. If you are a dog lover, given the chance, you won’t just write about your dog. You will post pictures and videos as well. Video sites, with the ability to create widgets, allow for the easy inclusion of video collections on supporting sites. The same goes for photography sites. Give people the chance to comment on content, and they will if you can garner the traffic. Check out Beth’s commentary on her blog.